Kevin Prestwich has been working with violins since 1993 after fate led him into a violin makers lofty studio in Santa Cruz California. 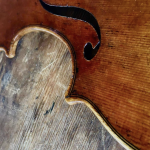 This brief meeting with a violin maker left him haunted, humbled, and inspired. His imagination ablaze, Kevin sought out a way to learn this craft. Shortly after this meeting, Kevin was hired on as an apprentice Under James and Steve Telford in Boise, ID. In 1997 Kevin was invited to move to Chicago to work in the Fine Arts Building in the shop of WH Lee & Co. Studying under and working with Chunyee Lu Kevin dug deeper into setup work as well as doing violin repair and restoration. In 2008 Kevin decided to start building his own violins. He moved to Utah and studied violin making with Paul Hart in Mount Pleasant Utah. 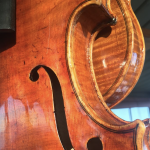 Since studying with Mr. Hart Kevin has deepened his skills by studying varnish making an application with Terry Borman, studying restoration with Hans Nebel, and studying deeper aspects of violin making with Michael Darnton. 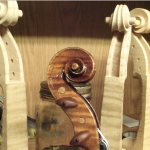 Kevin operates his shop out of his home in Boise Idaho where he builds violins based on the works of Antonio Stradivari , Giuseppe Guarneri “Del Gesu”, and Giovanni Battista Guadagnini. Kevin spends his summers working as a fire lookout for the Forest Service and scouting the rugged mountains of central Idaho for world class Engelmann Spruce tonewood for violin, viola, cello, double bass, guitar, and mandolin. The violin I bought from Kevin has a beautiful, rich tone. It sings and soars and doesn't let out the kind of screeches and squaks that my factory-made violin did. 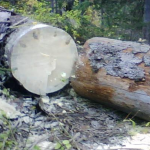 Also, it has a cool story behind it involving Kevin cutting the spruce he used to make it, using the tree's resin to make the varnish, and making the violin in a fire lookout on top of a mountain. Although he makes top-notch violins, Kevin is quite humble and approachable, and he has been very generous and mindful in making sure my violin is set up most appropriately for me in terms of components. In short, Kevin makes beautiful violins and is a great guy.